The visitor to the playground at River Breeze Estate is taken on a journey, along a winding path, past The Globe timber sculpture, and into a playground of wonder and fantasy. Alongside the custom designed Landmark shelters, you’ll find giant tomatoes and pumpkins, wide-eyed sculptured creatures, and a playhouse that looks like it escaped from a nursery rhyme. The developers of the 182-lot River Breeze Estate, just north of Brisbane, Trask Development Corporation, gave creative license to the landscape architect to develop a children’s park that would delight families who decided to make River Breeze their home. The entire design is a tribute to the pioneering farming family who lived on the land for over 100 years before it was developed. Landmark’s contribution to the park included the two custom built shelters, platform seats, Furphy picnic settings and bin receptacles, as well as full installation. The feature of the two cantilever shelters is the 90mm insulated roofing, beautifully complimented by the hardwood rafter pergolas supported by galvanised steel stays and turnbuckles, demonstrating Landmark’s skills in custom design and manufacture. 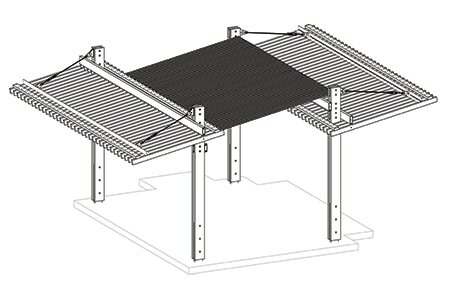 Both pergolas are “bolt below” reducing trip hazards, dual-leaf hardwood posts, and were delivered in kit-form on-site. The shelters supply healthy cool shade and blend in with the park design. An information board is featured underneath one of the shelters, telling the history of the land on which River Breeze is built – owned and farmed for over 100 years by the Bray family. The amazing sculptured tomatoes in the playground, the “farmhouse” playground, and the names of many of the streets of the estate, are all in recognition of the Bray family’s farming. Along the way the Bray family developed several new varieties of tomatoes, which we enjoy today, and developed modern growing techniques that continued to be used throughout the truss and table tomato industry.